Chaplain (CPT) Gerard H. “Hank” Mauterer, Jr., a native of southern Louisiana, graduated in 1990 from Wheaton College with a B.A. in Mass Communications, and in 2006 he earned his Master of Divinity degree from Southeastern Baptist Theological Seminary in Wake Forest, NC. In early 2012 he was commended to the military chaplaincy by his home church in North Carolina, Pembroke Family Fellowship, and was appointed as a Chaplain in the U.S. Army Reserve in late November 2012. After completing the Chaplain Basic Officer Leadership Course (CH-BOLC) in August 2013, where he earned the Distinguished Leader Award, he gained appointment as an active duty U.S. Army Chaplain in May 2014. Chaplain Mauterer has been married to the former Stephanie Kay Rowell for 25 years, and is blessed with five wonderful children: Myugi (24), Joshua (22), Elise (19), Christina (16), and Olivia (14). Being a Chaplain with prior military service, Chaplain Mauterer had earlier been commissioned a 2nd Lieutenant in the U.S. Army Signal Corps in September 1990. Upon completion of both the Signal Officer Basic Course (SOBC) and Basic Airborne School, in April 1991 he was appointed the E Company, 51st Infantry Regiment (LRS) (ABN) High Frequency Platoon Leader in Darmstadt, Germany, where he also completed the COMSEC Custodian Course (Honor Graduate) and Jumpmaster School, and in July 1993 he was reassigned to the 165th Military Intelligence Battalion (TE) as their Battalion Signal Officer. In August 1995, upon completion of both the Signal Officer Advanced Course (SOAC) and the Battlefield Spectrum Manager Course (Honor Graduate) at Ft. Gordon, GA, Chaplain Mauterer became the Brigade Signal Officer for the 35th Air Defense Artillery Brigade (PATRIOT) in Ft. Lewis, WA and was awarded the Signal Corps Bronze Order of Mercury. Then in September 1997 he resigned his Army commission and joined Fujitsu Network Communications as a GTE Sales Team telecom Sales Engineer. In response to God’s calling he began his seminary training in January 2003, and, following graduation, served as the Student Minister at Antioch Baptist Church in Lumberton, NC from August 2008 to September 2011. In November 2011 Chaplain Mauterer became a preaching elder at Pembroke Family Fellowship, which later commended him to the U.S. Army Reserve Chaplaincy in November 2012 and then Active Duty Chaplaincy in May 2014. Chaplain Mauterer’s first active duty Chaplain assignment was to the 5th Battalion, 73rd Cavalry Regiment (RECON) (ABN), 3rd Brigade Combat Team, 82nd Airborne Division as the Squadron Chaplain with whom he deployed to Taji, Iraq in support of Operation Inherent Resolve from January to September 2015. 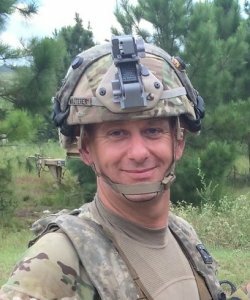 In September 2016 he was selected to be the Battalion Chaplain for HHBN, 82nd Airborne Division where he is currently still assigned. Chaplain Mauterer’s awards and decorations include the Army Commendation Medal (three bronze oak leaf clusters), the Army Achievement Medal, the National Defense Service Medal (bronze star), Operation Inherent Resolve Campaign Medal, Global War on Terrorism Service Medal, the Army Service Ribbon, and the Overseas Service Ribbon (numeral two). He is authorized to wear the Army Parachutist Badge, the British Parachutist Badge, the Canadian Parachutist Badge, the Danish Parachutist Badge, the German Parachutist Badge, and the Bronze Order of Mercury.